Labomed Electrolyte Clinical Analyzer IO-005 ISE Ion Selectively Electrode . New Life Scientific, Inc. This Labomed IO-005 Electrolyte Analyzer powers on and initializes, however, it could not be completely tested due to an aspiration error caused by a faulty seal in the probe aspiration block. This instrument is in good physical condition, with only minor cosmetic wear and a broken left hinge in the front panel door. 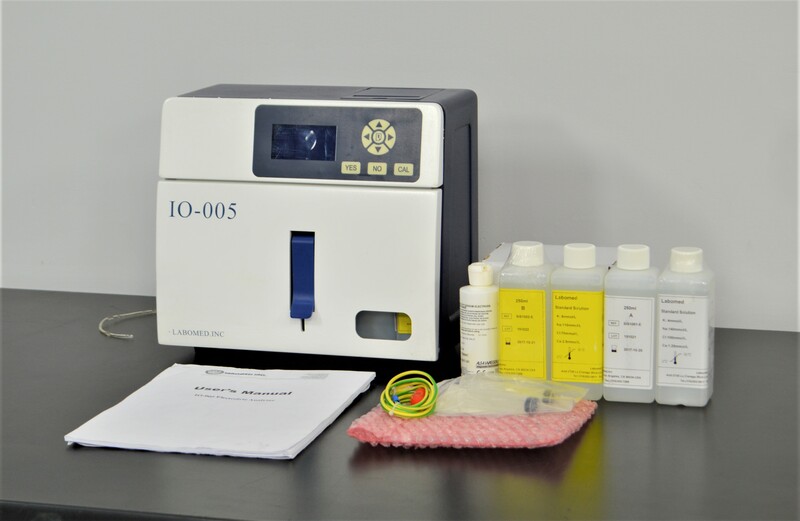 Standard Solution A and B reagents are included as well as an IO-005 Electrolyte Analyzer User's Manual. Our in-house technician inspected and tested this Labomed IO-005 Electrolyte Analyzer, confirming it to pass initialization and the pump to be working. During testing there was a "cannot aspirate A" or "cannot aspirate B" error caused by air leaking into the line due to a faulty seal in the probe aspiration block. This block will need to be replaced. The detector was also tested, but the results were not validated.